Hikers be warned: There are no signs to tell you that high tide will cut off your only way back from the farthest parts of the causeway. Before setting out on the Breakwater Walk, it is important to take a peek at the tide charts and plan accordingly. A mid-day hike is usually a safe bet, but other times in the morning and evening can also be ideal. Regardless of when you set out to explore, know when high tide will occur that day. Otherwise, you’ll be in for a long trek home along the outer beaches on the far side of the harbor. More fun than monitoring the tides, you should also be on the lookout for the Cape’s best wildlife as you walk along Provincetown’s causeway. After the tide recedes, small pools of water filled with hermit crabs and starfish are left in the spaces between the rocks. Overhead, you’ll see plenty of seagulls looking for lunch. The birds will use the granite slabs to break open shellfish if they haven’t been fed first by generous tourists. In addition to small critters underfoot and birds in the air, keep an eye on the water. The luckiest of hikers will catch a glimpse of baby seals as they swim by with their herd. For the ambitious hiker, a one-hour walk along the causeway easily becomes a whole day of exploring. After reaching the edge of the causeway, most walkers turn around and head back to the starting point. But, for those who haven’t yet had their fill, an additional 30-45 minutes of walking brings hikers to the lighthouse at Herring Cove. To get to Long Point Lighthouse, visitors must first cross the Breakwater to Wood End, then walk across the sand until reaching the lighthouse grounds. The grounds of the lighthouse are open to the public, while its interior is not open for tours. Nonetheless, this rarely visited area is a great addition to a day spent exploring the Provincetown Causeway. Plan Your Trip to the Provincetown Causeway! Admiral’s Landing is a short 10-minute drive from the Breakwater, making it a great place to call home during your visit to Provincetown. After a day of exploring, there is nothing better than returning to the comfortable accommodations at our inn. We’ll greet you with the promise of a peaceful night’s sleep and fresh-baked goodies for your breakfast before starting the next day’s adventure! 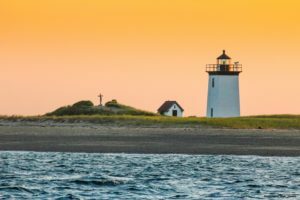 There are so many things to do and see in Provincetown that you may even want to extend your stay by a day or two. We hope that you will join us! This entry was posted in Cape Cod Beaches, Outdoor Activities, Provincetown Lighthouses, Things to Do and tagged Long Point Lighthouse, Nature in Provincetown, Provincetown Causeway, the Breakwater Walk, Things to do in Provincetown by Admirals Landing. Bookmark the permalink.